Сэкономьте $20.00 выбрав эту опцию сейчас. Accelerate the steps between you and your supplier (and/or carrier). 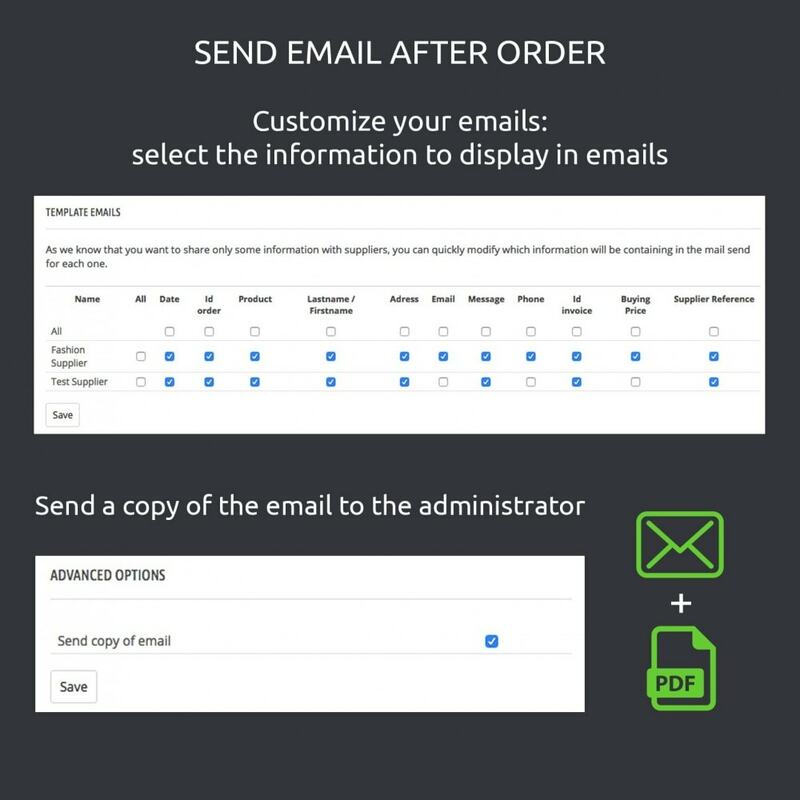 When a customer buys in your shop and it creates an order, an e-mail is sent directly to your supplier (or carrier) for them to prepare the order. Accelerate replenishment with suppliers, through automation of ship orders based on purchases made on your shop. You will see a significant time savings thanks to the complete information of each command that can be transmitted automatically to the different suppliers. Enable Dropshipping. 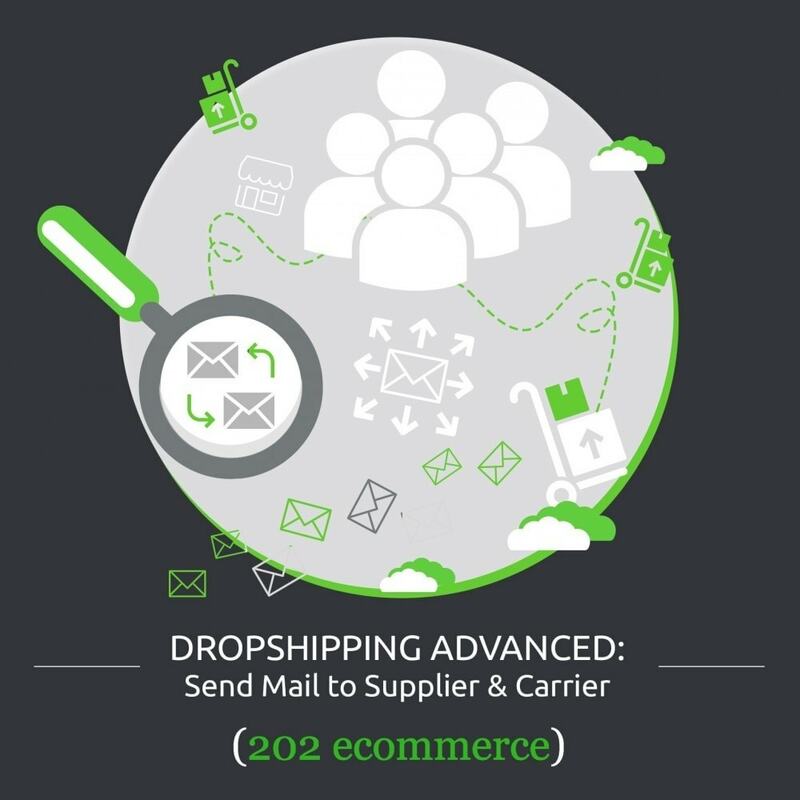 With this module, each supplier will receive an email with all necessary information to carry out the dropshipping: the order number, product number, the name of the item, the quantity purchased, the delivery address and additional information if specified by the customer. As for carriers, they can receive the same informations (+ specific data about weight of products ordered etc). Adapt your communication. With our latest update you can now choose to export your order book in CSV format : the .csv file can grouped by order or by product. NB : All configurations must be done separately for suppliers and carriers. 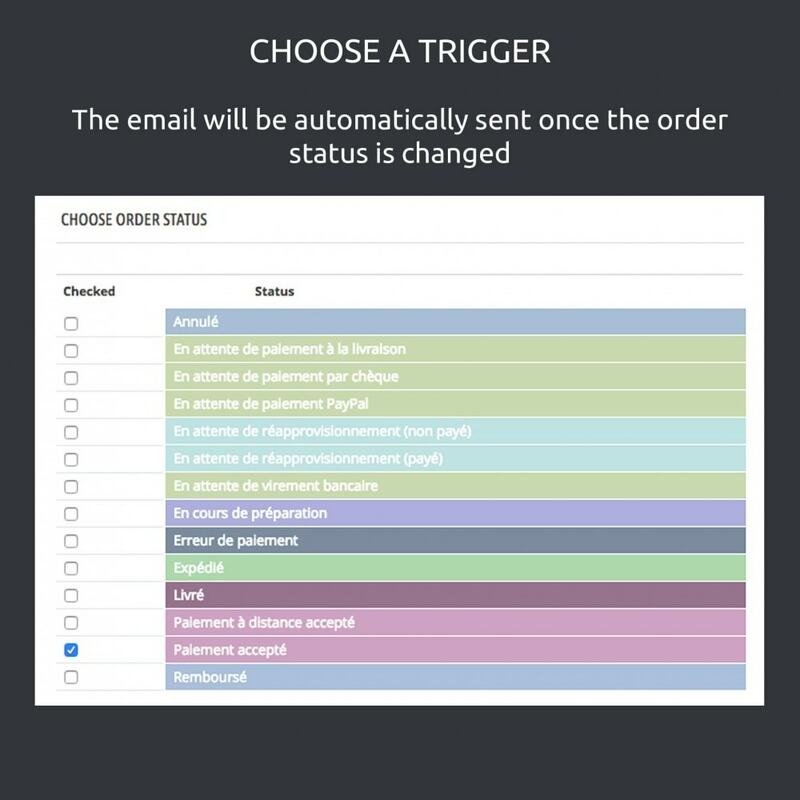 Set the order status to which an email will be sent directly to the supplier/ carrier. Enable/Disable visibility of final customer's email. 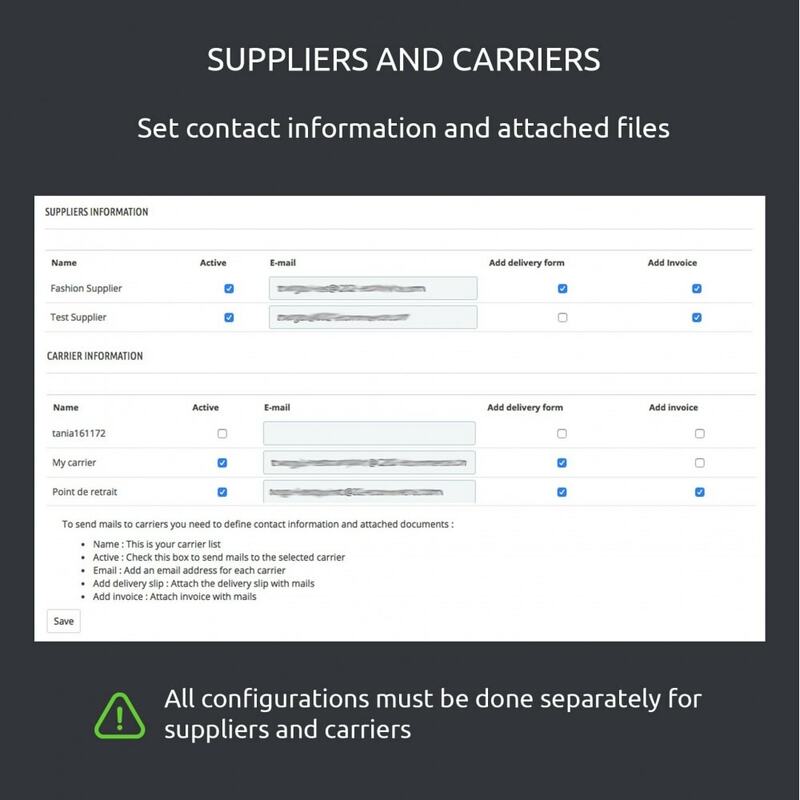 You can allow your suppliers (carriers) to send a mail to your customers, or not. Enable/Disable visibility of final customer's delivery address. You can allow your suppliers to ship the product directly to your customers, or not. 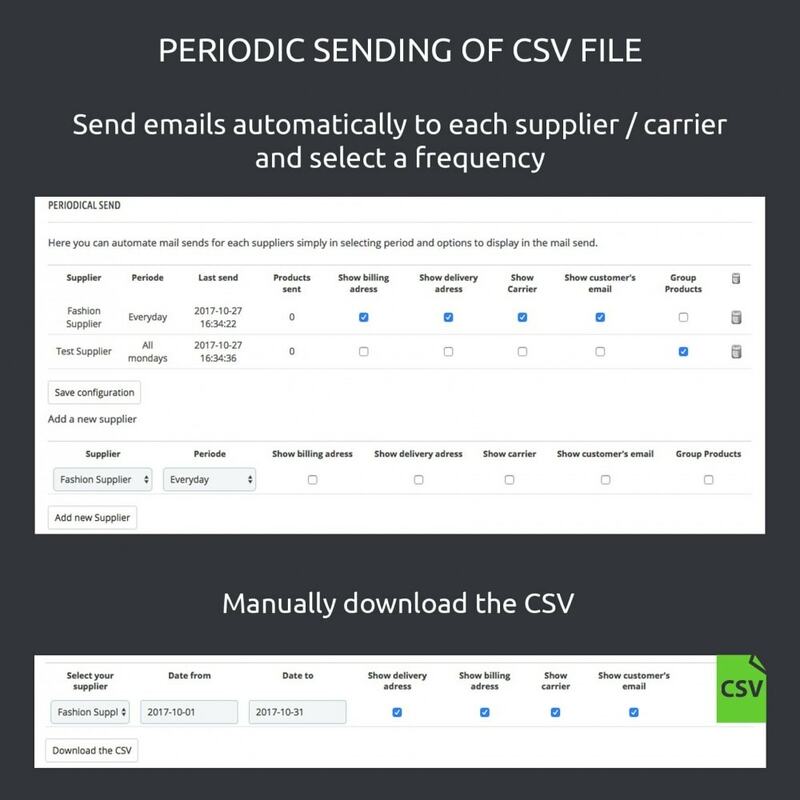 Periodic sending : select a frequency and send emails automatically with .csv in attachment to each supplier / carrier. Each supplier (carrier) will receive an e-mail with the order number, the product reference, product's name, the quantity bought as well as the customer's delivery address and the customer's message if included. If multiple products from different suppliers are ordered, each supplier will receive only their product’s orders by email. For example, with an order of two products (iPod from Apple supplier and Earphones from Shure supplier), the Apple supplier will receive an e-mail with just the iPod order, and will not see the other earphone order. 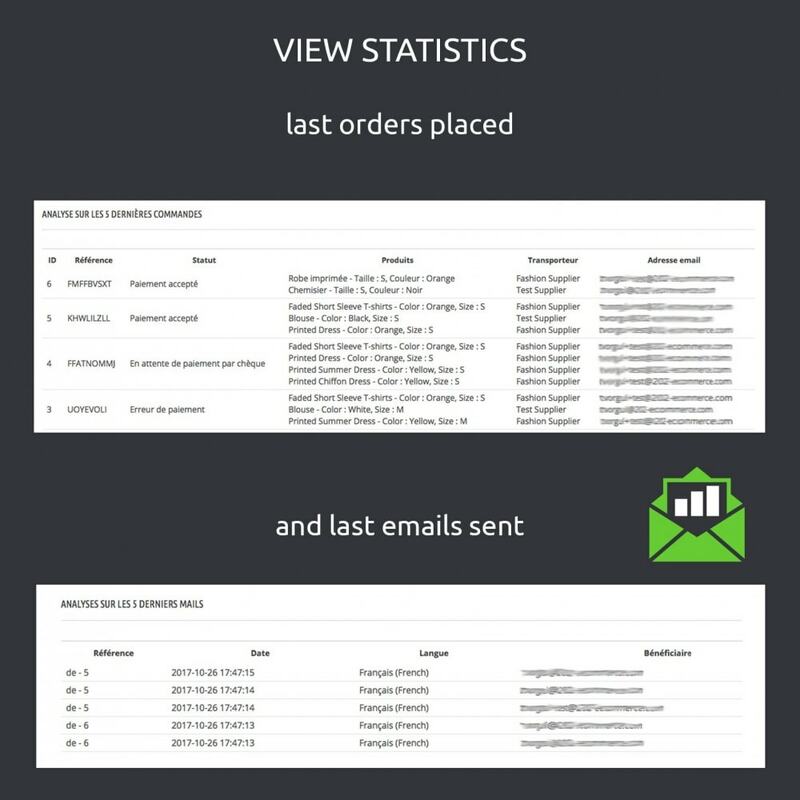 Generate manually or send automatically a CSV file per supplier / carrier with every order of your customers within a selected time period. This module allows you to automate your restocking or to drive your dropshipping system. A “download” button for generate and download the CSV. The date of last execution is displayed in order to be able to check the CRON task execution. This module will allow you to create a CSV file of orders received. The file can be downloaded or automatically emailed to your suppliers / carriers. 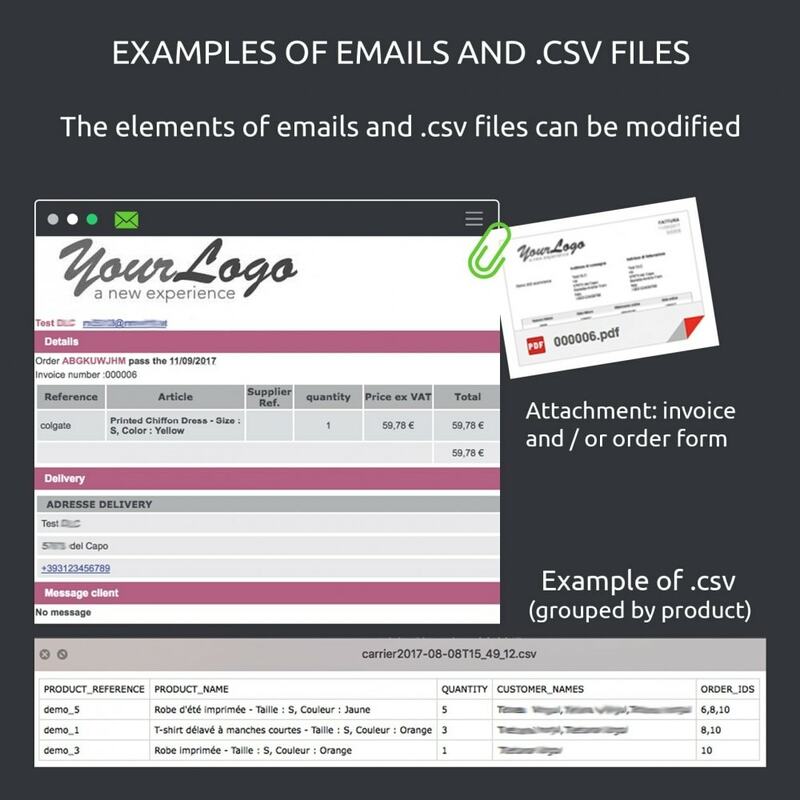 By sending your orders in a CSV file, you offer your partners a simple solution using a standard data exchange format. We suggest to you the module “Suggested Products in Cart (Cross Selling)” for efficient cross selling and to maximize chances to increase your turnover. We are a web agency specialized in ecommerce web site and adapting web technologies for online sale. Composed of passionate web professional in online sale, we are working alongside e-businessmen enlivened by the same wish to sell always more. Installing the module is very simple. Just go to the "Modules and Services" tab in your back office, then click on "Add" to install the new module in your environment.